← Ebooks: Cheap, or Inexpensive? I SPIDER is a darkly fascinating tale of a young man’s descent into murder and madness. As the story unfolds, you really get the sense that the protagonist is losing his grip on reality. It’s all told from a disjointed first-person point of view that captures the character’s sense of confusion and frustration. He soon becomes obsessed with the idea of killing a man, and his choice of weapon is most unique: spider’s venom. Lance does a fantastic job setting up the story as he describes a spider-infested Australia. It’s a chilling yet believable world, largely due to the detailed anecdotes documenting our “hero’s” various encounters with spiders throughout his life. They’re simply everywhere. But despite the constant danger, he develops an oddly symbiotic relationship with the creepy crawlers, eventually cultivating them to carry out his own nefarious plans. The story builds to a terrific climax with a surprise twist at the end. It’s exactly the kind of book you aren’t likely to get from a traditional publisher, so check it out! Over the last year, Lance and I struck up a friendship. When my own book The Woodlander came out, he was kind enough to return me the favor of reading it. Not only did he leave me a flattering review, he then one-upped me in the nice guy department by creating the wonderful image above depicting my character John Grey. I have to say, he really nailed it! That’s pretty darn close to what I pictured in my head as I wrote that scene. Anyway, the point of all this isn’t to tell you what great guys we are (I think that’s pretty obvious), but to announce a partnership. After reading a recent post on Lance’s blog, I left him a comment suggesting a “what if” scenario. I was halfway joking at the time, but Lance loved the concept (and maybe more importantly, his wife did, too). He asked me if I would be interested in collaborating on a book together. I jumped at the opportunity. Normally, writing is a solitary pursuit, so having the chance to bounce ideas off another author has been great. The proposals have been flying back and forth between the States and Australia as we try to nail down the plot. We’re not quite ready to announce the premise yet, but suffice it to say it will be a thriller with sci-fi elements, all loosely based on historical events. At this point, we’re still very much in the research phase, but every fact we uncover just seems to inspire more great ideas. It’s been very exciting thus far, so wish us luck! Congrats on this development. I love it when a fine collaborative project brings a sort of creative buzz into your life. It’s a good-for-you sort of drug. Thanks! The enthusiasm is contagious. I usually don’t get any feedback until I’ve completely finished writing a book, so this collaboration will be a nice change of pace. Collaborations can be tricky, but a ton of fun when they click right. Hope it goes awesomely! And great image of John Grey – that’s about what I pictured when reading it, too! Thanks for the review of I SPIDER, Kirk. Your idea is great and I feel privileged to be along for the ride. Let’s hope our collaboration works as it has already helped to crystallize a pretty sound plot. Don’t let it stop you writing Woodlander 2, I’m looking forward to it. My pleasure, Anthony! 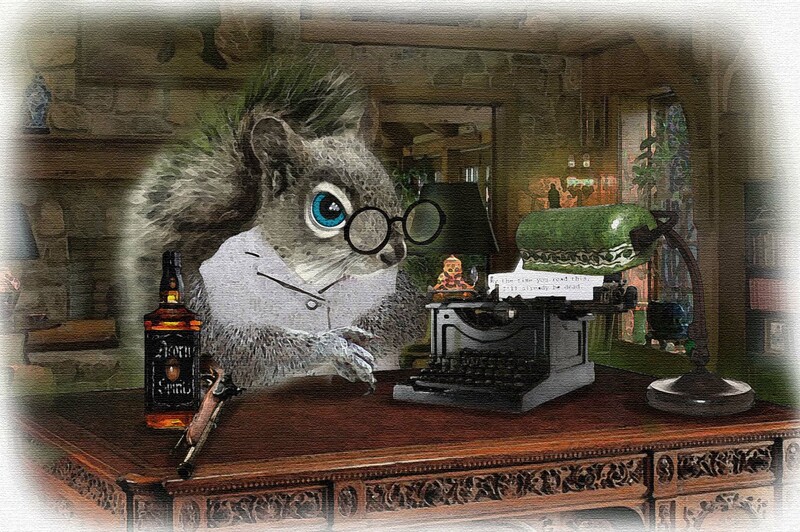 And don’t worry, work on the sequel to The Woodlander continues! I think we’re both juggling multiple projects at this point. I don’t know about you, but I’m looking forward to writing in a different genre with this book of ours. It should be quite a departure for both of us!